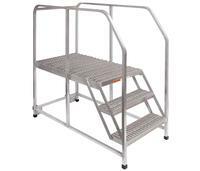 Aluminum Mobile Work Platforms are weather and corrosion resistant while providing a secure workspace at a variety of heights. 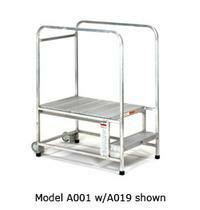 Each can be easily rolled from job to job on its dual 4" rear casters. Up to 300 lbs. capacity. Meets or exceeds OSHA standards. Steps are 7" deep. Choose 35-, 45-, or 49-inch platform depth. Choose Solid Ribbed Extruded step or technologically advanced Grip Strut tread for slip resistant footing.